Our Savior’s Community Services is a South Minneapolis-based nonprofit organization doing very important work through two vital programs. First, they provide housing to homeless single adults through the Our Savior’s Housing initiative, which brings shelter to over 600 people annually. Second, through their English Learning Center, OSCS provides English language classes to immigrants and refugees. Both types of work are necessary and integral to their mission of increasing skills and improving lives. 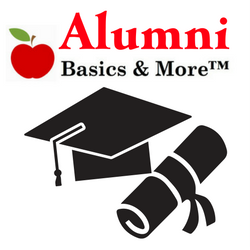 OSCS is a Basics & More alum, and their recent enewsletter immediately speaks to supporters on an individual, personal level, as well as on a community level. It all begins with a letter (including detailing recent progress and events) before launching into storytelling territory. And for an enewsletter, great stories are essential. They wonderfully reveal progress, shining a light on it. They do this in a way “simply telling” just can’t. The enewsletter is simple, focused, and free of clutter. It gets straight to the point and ties in seamlessly with their website. 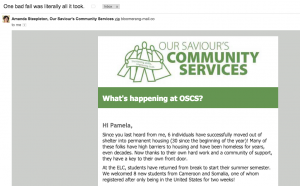 The story snippets featured, straight from a program resident and an ESL student, include clickable links that redirect to the rest of the story, published on OSCS’s site. There are also three opportunities for support: through volunteering, through non-monetary donations, and through making an online gift. Check it out!